We are a charitable organization that is committed to providing recreational activities for individuals with Autism and other disabilities through grants, fundraising events and community support. Share A Vision believes in the rights of those we serve to realize their potential as individuals by growing, changing, adapting and experiencing a life full of age appropriate opportunities. To enrich the lives of persons with autism spectrum disorder and other disabilities by providing professionally planned and supervised recreational leisure opportunities, such as: Vacations, Family Outings, and Social Groups. Our next Disney trip is in the works. 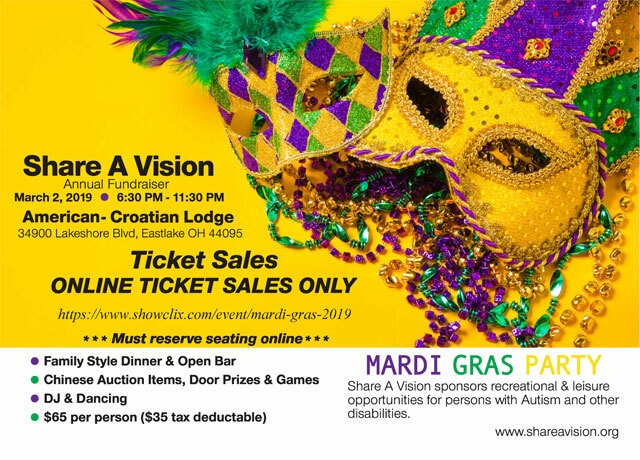 Ten individuals and their families will be working with the Share A Vision staff preparing to head to Florida in May of 2019. Please consider supporting this very special group of travelers by participating in our Sponsor a Child Program. us for more information. Play is work, and work is play"
is a saying common to those providing services to people with autism. The more organized, predictable, structured and consistent nature of work is often a more comfortable environment that promotes learning, growing and changing in a comfortable, safe surrounding.